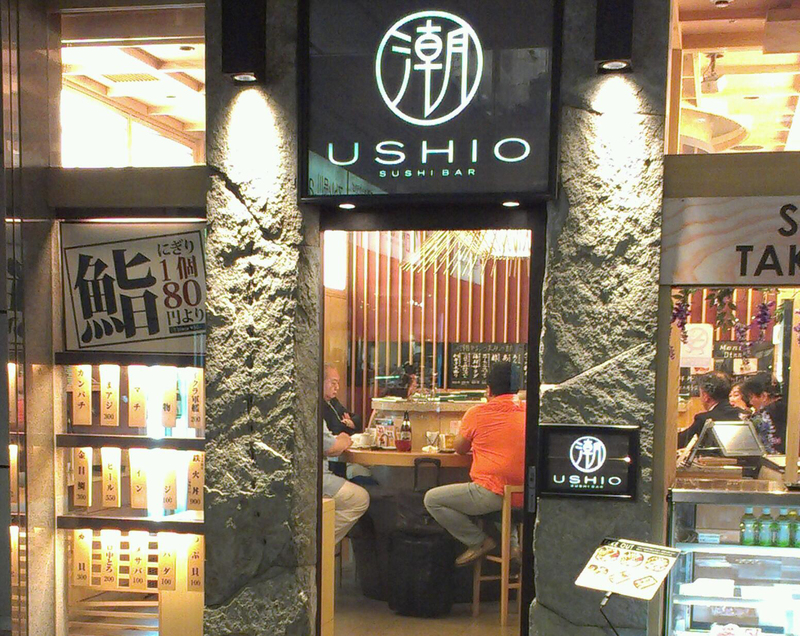 @Shinagawa | Get Your Grub On! OMO – Oh My Okonomiyaki! I wasn’t super hungry this evening because of my late and generous ‘Menya Musashi‘ lunch but still felt like a little something to close the day. I randomly went into the Shinagawa Front Building and when I realized that there is a ‘Okonomiyaki Kiji’ branch located on the second floor I decided to have a slightly bigger dinner than anticipated as in Singapore this seems to be impossible to get. I decided to go less traditional and ordered a ‘Kimchi & Pickle Starter‘ and the ‘Pork & Kimchi Okonomiyaki‘. As I was sitting at the bar I could follow the action as the chefs were entertainingly preparing mine and other dishes which was particularly important because a good and thick Okonomiyaki can take around 15-20 minutes. 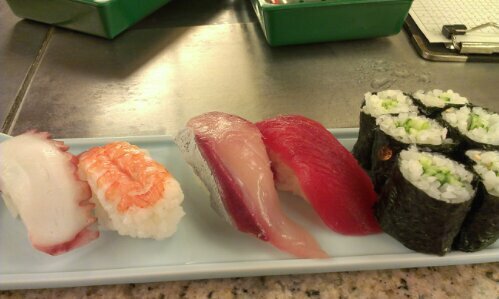 It looked beautiful and tasted fantastic. The big chunks of kimchi cabbage had a nice bite and heat to them and were balanced just right with the Oko-dough. Best about this though was the thick slices of pork belly on top. Whilst preparing, I was a bit worried as the pork often doesn’t get enough time on the flame but here they took their time and waited until the fat melted away and the meat transformed into crispy salty goodness. All finished with salty butter and freshly chopped green onions on top. Simple food tweaked to greatness. 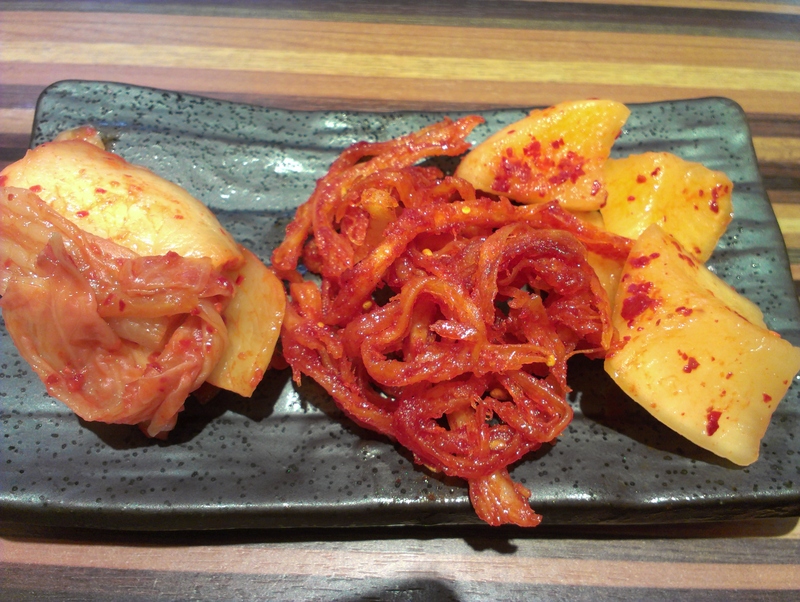 The ‘Kimchi & Pickle‘ starter upfront helped me through the waiting time with it’s great tastes and different textures. The pickled radish was crunchy and cooling and the the kimchi style cabbage had a very mild taste with only a little bit of spice to it. My favorite of all was what seemed to be some kind of kimchi cabbage jerky as it was stringy and quite hard to bite and by far the most spiciest of the trio. ‘Okonomiyaki Kiji’ is a famous brand from Osaka and they sure lived up to their name. I am pretty happy to have stumbled into this shop as I didn’t have any decent Okonomiyaki in years as it just seems impossible to get a remotely good one in Singapore. I would do it again and again and again. After a long day at our Tokyo office one of my colleagues and I went to ‘Vento’s’ pretty much only because it was the most convenient and only two minutes from both our hotels. We sat down outside and I felt a bit bad being in Japan and having Western food already on the second day. My regret only lasted until my beautiful ‘Margarita’ showed up. This was without lie one of the best pizzas I have ever had in my life; pure brilliant simplicity. 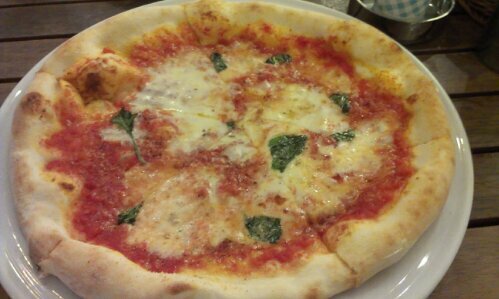 I haven’t had tasted such a fantastic and sweet tomato sugo in a very long time. The pizza was not overloaded with cheese so I was able to really taste all of the few ingredients as well as the thin dough. It was so thin that the area in the middle became juicy tomato-y goodness whilst the outer crust stayed chewy and tasted like very well seasoned pizza bread. Service was very friendly and fast and the outside seating was just the right thing to do after a day locked inside an air-conditioned meeting room. Most importantly the food was outstanding so I give this place a double thumbs up. Bueno!